A manhunt is under way in Istanbul for a gunman responsible for killing 39 people and wounding dozens more at a nightclub in Turkey's largest city. Interior Minister Suleyman Soylu said 15 of the 39 people killed in the early hours of January 1 were foreigners. He said 69 people were wounded in the attack and that four of them are in critical condition. The gunman -- reportedly dressed as Santa Claus -- killed a policeman at the entrance to the Reina nightclub in the city’s Ortakoy district about one hour after midnight. Carrying a long-barreled weapon, he opened fire on many of some 500-700 people in the upscale club who were celebrating New Year's Eve. Several people reportedly jumped into the Bosphorus Strait to escape the gunfire. 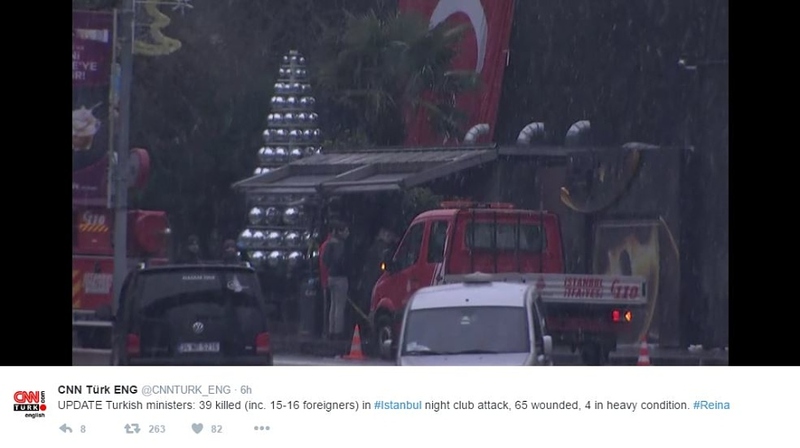 Istanbul Governor Vasip Sahin described the attack as a "terrorist" incident. "Unfortunately [he] rained bullets in a very cruel and merciless way on innocent people who were there to celebrate New Year's and have fun," Sahin said. No one has claimed responsibility for the attack. Soylu said the attacker had not been identified and was still at large. He said the gunman was believed to have removed his Santa suit and left the club wearing different clothes. "Our security forces have started the necessary operations. God willing, he will be caught in a short period of time," Soylu said. Turkish President Recep Tayyip Erdogan said the attack was aimed at creating chaos in Turkey. "They are working to destroy our country's morale and create chaos by deliberately targeting our nation's peace and targeting civilians with these heinous attacks," Erdogan said in a statement on the presidential website. The Turkish government has imposed a media blackout regarding the January 1 attack, making an exception only for statements by government officials. Police have launched a manhunt in #Istanbul after #Reina nightclub attack. In the United States, the White House condemned the incident as a "horrific terrorist attack." U.S. President Barack Obama ordered that all possible assistance be provided to Turkey. Security was high as the city was celebrating New Year's Eve. In Istanbul, some 17,000 police were reportedly on duty. Istanbul and the Turkish capital, Ankara, were hit by numerous terrorist attacks in 2016. On December 10, 44 people were killed and 149 injured in a double bomb attack outside an Istanbul soccer stadium.